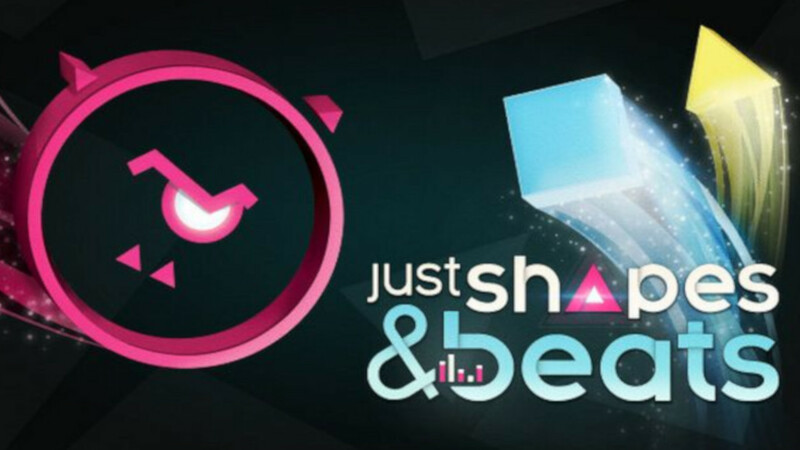 Just Shapes & Beats is an action-arcade game developed and published by Berzerk Studio. It combines the style of an arcade shooter with rhythm game elements to create something pretty special. As the name implies, there are two main parts to the game. When it comes to “shapes”, it’s like playing a shooter without the shooting. You control one of four shapes – a blue square, yellow triangle, green pentagon, or orange circle. 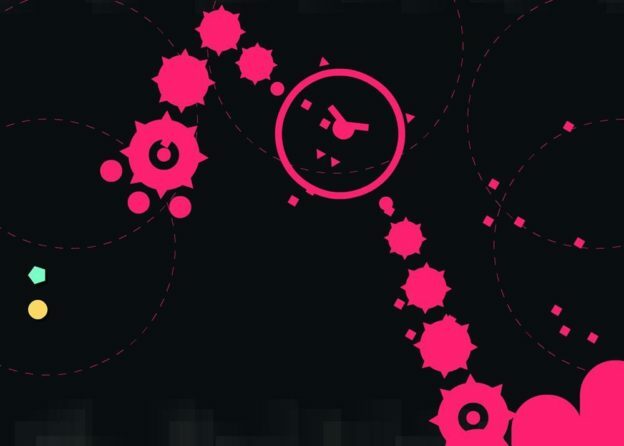 Your sole purpose is to avoid the swarming pink circles and lines around you, which are derived from the second part of the game’s namesake. The “beats” component controls those obstacles within each level, with throbbing songs that create a hypnotic experience, ebbing and flowing around you. It’s like playing inside a subwoofer, with each beat hitting your audio and visual senses as the pink objects pulsate in time. 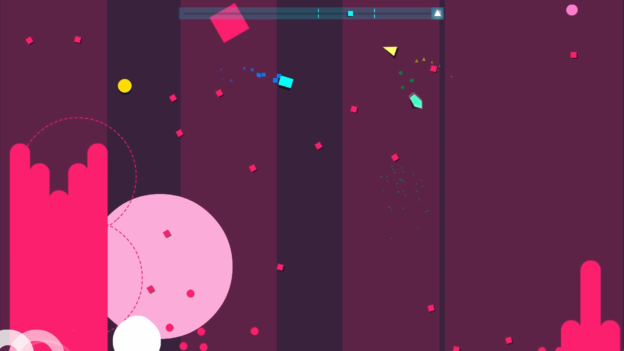 Circles grow and expand, shooting little bullet-like projectiles toward you. Pink lines stretch across the screen, then rotate or disappear like an epileptic kaleidoscope. Some of these cleverly form recognizable objects, like worms or other creatures that serve as a type of boss to avoid. It’s quite mesmerising. When any of these moving pink enemies overlap with your shape, the touched part of you disappears. It’s like creating negative space until, piece by piece, you’re reduced to a tiny pixel. Once that’s gone, you’re sent back to the start of the last checkpoint. Thankfully the game isn’t terribly punishing, instead offering an upbeat journey through a pixelated world of color and sound. There are challenging sections though, so to help keep player frustration levels down, there are several ways to play. Just Shapes & Beats offers four main modes from the outset: Story, Challenge, Playlist, and Party. Story Mode sees you play through themed stages on a journey to befriend other shapes and battle pink monsters. In Challenge Mode, you can unlock more songs by completing missions, like surviving three tracks in a row or finishing a level without dashing. In Playlist Mode, you can build your own song list from those you’ve already unlocked. Party Mode is more of a casual mode; there are no penalties or death, just random levels to get through together. All modes are available with multiple players, emphasising the co-op approach to this game. Playing with friends is more about teamwork than competition. Sure, you can compete to see who survives the level, with some friendly stats at the end, but cooperating to get through those tricky parts feels much more rewarding. This is further encouraged by a helpful mechanic that allows you to rescue fallen players who are drifting off screen as lonely pixels. The game’s main draw cards are the visual and audio elements, and it delivers on both fronts. The songs are big and bold, with plenty of upbeat tunes to collect. There’s a chiptune component to them, like a mix of dubstep with retro shooters that thump and rock as you play. The colors girate and pulsate in a rhythmic pattern that’s hypnotic; there’s even a health message at the game’s outset warning players of potential seizures. Players with such tendencies should steer clear of this game. If you don’t like bright, flashing lights that pulsate, this isn’t the game for you. Overall, Just Shapes & Beats is a mesmerising ride through a world full of audio and visual stimulation. The addictive gameplay is immediately accessible and fun, particularly with a group of friends. It’s well made, with great tunes, and offers plenty of options to keep you playing. Give this one a try! 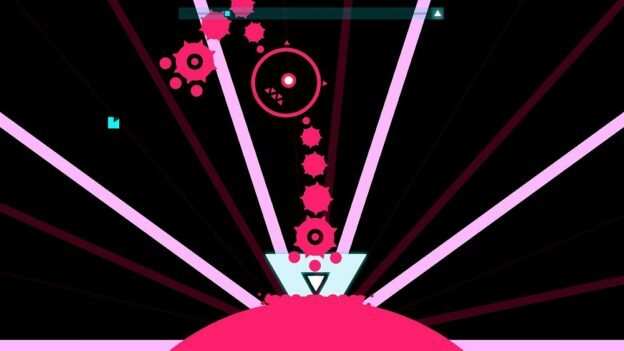 Just Shapes & Beats is a unique combination of rhythm and arcade games that’s fun and accessible. There’s a lot of visual and audio stimulation, but it works well and makes for a fun party game.